If you’ve ever enjoyed a gourmet meal at a high-end steakhouse, you’ve probably noticed a wide variety of cuts available on the menu. From sirloin to filet, NY strip to prime rib, each cut of steak has its own unique flavor and texture profile and connoisseurs can spend hours debating which is the best cut of steak. While each of these steaks is more than fine, two typically stand out at the top for flavor profile and popularity. The ribeye vs porterhouse steak debate is one truly meant for the history books. Whether you’re planning a home cooked gourmet steak dinner, or just always wanted to know which cut of beef to choose, Steak University has you covered. Keep reading to discover the difference between porterhouse and ribeye and which steak is right for your meat loving taste buds. If you’re a dedicated reader of Steak U, you know that the ribeye steak takes its name from the cut’s original location along the upper rib cage of the cow, closer to the head and neck. Given the lack of movement and fatty nature of meat in this area of a cow’s anatomy, the ribeye or rib steak tends to be well marbled and tender. The downside is that, for some, a ribeye can be a bit too fatty. In contrast, the porterhouse steak comes from the lower rib portion of the cow, closer to the loin or rear end. This area gets a similar level of exercise to the ribeye, but has a lower fat content, making it more palatable to some steak lovers. The porterhouse is actually made up of two different cuts of beef, the tenderloin along one side and a strip steak on the other. The main differences between the porterhouse and ribeye comes down to fat and bone content. The porterhouse contains a “T” shaped bone, while the ribeye can come in bone-in or boneless varieties. Ribeye steaks have a distinctive “meaty” flavor given the high fat content. 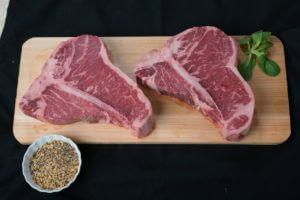 A porterhouse steak also has two different texture and tenderness profiles given the two different cuts of steak involved. There are also differences in preferred cooking method of a ribeye vs porterhouse steak. A ribeye will generally contain one bone towards the outside of the beef or no bone at all. 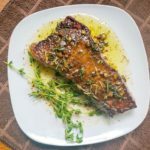 This makes the ribeye an excellent choice for pan frying, grilling on the BBQ, broiling in the oven, or just about any other application of heat and fire you can think of. When grilling over an open flame you should be cautious of flare ups caused by the melting fat which can char your gourmet steaks in a hurry. The porterhouse, by contrast, has an inconsistent profile with a large center bone, making a good sear achieved through even contact with a hot pan a difficult proposition. The lower fat content makes this cut a good candidate for open flame grilling. A porterhouse steak also needs a slightly greater cooking time, 3-4 minutes per side as opposed to 2-3 for a ribeye, given the large center bone and typical size of the steak. What about a T-bone Steak vs. Ribeye? We wouldn’t be doing our Steak University readers justice without also talking about T-bone steaks in the porterhouse vs ribeye conversation. Remember how we mentioned earlier that the porterhouse has a distinctive T shaped bone in the middle? Turns out the T-bone and porterhouse cuts are very similar. In fact, the only difference between the two is size in the round tenderloin portion of the cut. A porterhouse will contain a large, round full cut of tenderloin. A t bone will only have a half circle cut of tenderloin, giving the steak that distinctive T-bone shape. There you have it, everything you need to know when it comes to the difference between a porterhouse and ribeye or a T-bone steak and a ribeye. What is the best cut of steak between the two? Well that depends on your tastes! We suggest trying both to help decide which steak is right for you. After all, variety is the spice of life. Browse Chicago Steak Company’s famous selection of porterhouse and ribeye steaks and decide which you like better for yourself. The main differences between the porterhouse and ribeye comes down to fat and bone content. 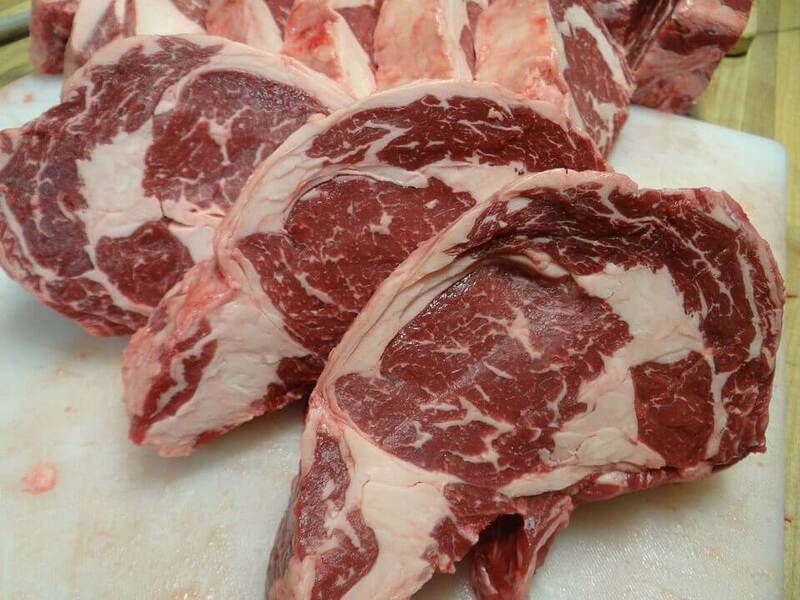 The ribeye steak derives its name from the cut’s original location along the upper rib cage of the cow. Given the lack of movement and fatty nature of meat in this area the ribeye or rib steak tends to be well marbled and tender. For some, a ribeye can be a bit fatty. The ribeye can come with or without a bone. In contrast, the porterhouse steak comes from the lower rib portion of the cow, closer to the loin or rear end and has a lower fat content. The porterhouse contains two different cuts of beef on each side of its signature T-shaped bone, a tenderloin and a strip steak. Ribeye steaks have a distinctive “meaty” flavor given its high fat content. 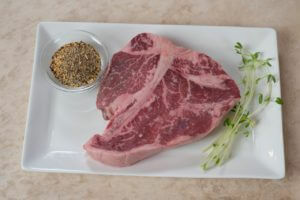 A porterhouse steak has two different texture and tenderness profiles given the two different cuts of steak involved. 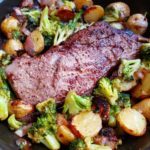 The ribeye is an excellent choice for pan frying, grilling on the BBQ, broiling in the oven, or just about any other application of heat and fire you can think of. The lower fat content makes the porterhouse cut a good candidate for open flame grilling. A porterhouse steak requires a slightly greater cooking time, 3-4 minutes per side as opposed to 2-3 minutes for a ribeye. Browse Chicago Steak Company’s famous selection of porterhouse and ribeye steaks and decide which you like better for yourself.